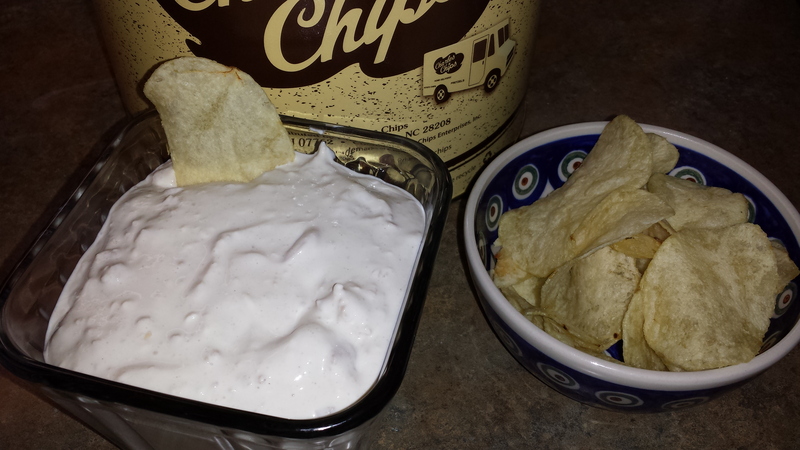 While this one isn’t completely healthy, it is a comfort food sort of dip that has been a local hit for as long as I can remember. I’m dedicating this one to my brother who was mentioning recently that he couldn’t find it in stores anymore. While this might not be the healthiest of dips I’ve been sharing, this homemade version is definitely more healthy that a store-bought brand. I wasn’t brave enough to create my own version so I searched and found one closest to what we’re familiar with out of the Yankee Magazine site. There are only two things I’d do differently which is add a second can of clams (or another 6 oz. if you’re using fresh) and cut the lemon juice back to 1 TBS. instead of 2. I also didn’t have onion juice, though I wonder how easy it is to make?, so I used 1 TBS. onion powder with 2 TBS. clam juice since I saved it in a bowl until I was done mixing. Drain the clams, reserving some of the liquid, and mash into the softened cream cheese. Add the remaining ingredients and blend well. If a thinner dip is preferred, use 1 or 2 tablespoons of the reserved clam liquid to thin the mixture. Serve with corn chips or potato chips. I’m making this dip again but in place of onion powder I’ve decided to press onion juice from an onion with a garlic press and grate some of the onion into the dip as well. I will also add more clams as mentioned in the post. I’ll let you know how this batch comes out.